Phoenix, Arizona, is known as a baking hot spot in the desert. But in the wintertime it just isn’t so. For the past week camping in the Tonto National Forest in our RV, we have had overnight temps in the low 20’s Fahrenheit, and we have woken up to see the delicate etchings by Jack Frost on everything, from the lace-like tree leaves to the truck window. On New Year’s Eve we had grey drizzle and rain all day long, and that night it turned to snow. The next morning our dry desert world was transformed into a winter wonderland. We were huddled down and keeping toasty warm in our trailer all morning, but when we finally got out later for some pics of the Four Peaks mountains in the distance, with a few saguaro cactus in the foreground, Mark got a winner. 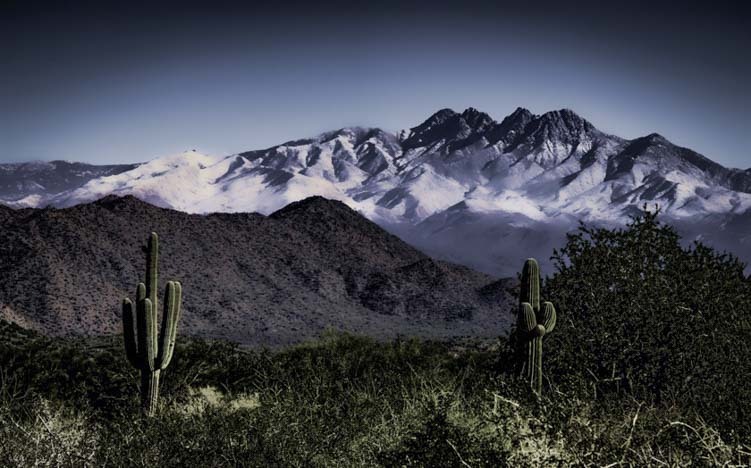 A blizzard in the mountains near Phoenix Arizona! Does this look a little too exotic to be true? Well, it is. Mark loves the post-processing part of photography, and he used Topaz Adjust to get this fabulous effect. The original photo was a lot more ordinary, and the snow on the mountains just didn’t look that dramatic. Some folks feel that messing with your images is not being true to recording what you saw. But photography, is a way of conveying an emotion, a mood, a thought or a scene, and the images are an expression that gets filtered through the mind and personality of the person who takes it. So, whether the finished product is an attempt at documenting reality or a fanciful interpretation, the end result is an amalgam of what the photographer saw and what s/he wants you to see. 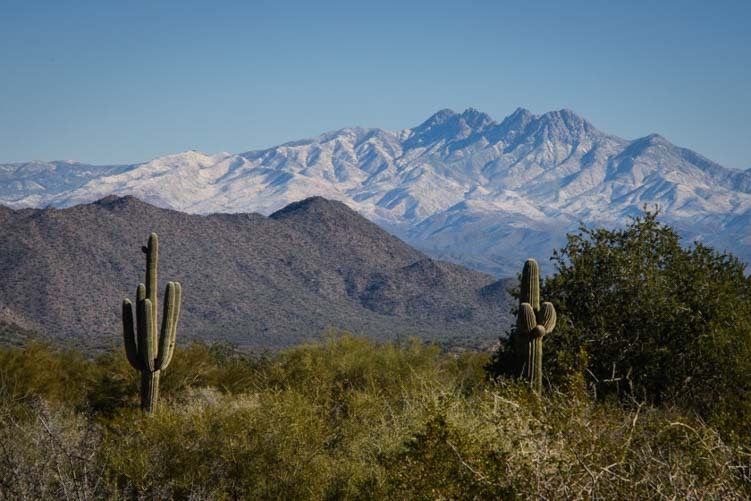 Four Peaks with a dusting of snow – as shot! It’s also a way of making it look like we experienced a really awesome blizzard when it was actually just a light dusting that melted too soon. Highs are supposed to climb into the 70’s for the next week, and overnight lows will be back in the more tolerable 30’s! This entry was posted in Quick Pics and tagged Arizona, Quick Pics by Roads Less Traveled. Bookmark the permalink.